When a house is for sale, the goal is to make it as attractive as possible to potential buyers, and the most cost-effective way is a professional cleaning. Spruce up your home and clean it thoroughly. Potential buyers might take one look at stained carpet and start running for the door. At a fraction of the cost for replacement, you can get the existing carpet in sellable condition quickly with a professional clean. Bishop Clean Care can save you money down the road by making what you have look its best while avoiding costly replacement or an allowance for new installation. 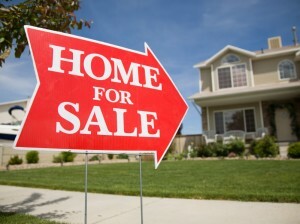 Focus on the rooms buyers are most interested in – living room, dining room, kitchen and bathroom. Give major attention to the kitchen and bathrooms, but be sure to check labels on cleaning products to make sure they are appropriate for the surfaces to be cleaned. Kitchen floors often become cloudy from cleaning solution residue. To prevent this, use a no-rinse product or rinse the floors well after each cleaning. Mold and mildew are especially problematic in bathrooms, and prospective buyers are more sensitive than ever about its presence. If you are unsure whether to tackle this yourself, give Bishop Clean Care a call so we can point you in the right direction to keep your family safe. – Vacuum regularly, using long strokes. – Carefully clean surfaces to remove dust, grime and fingerprints. – Make a habit of making a nightly “sweep” just before bedtime to nix clutter build up. Bishop also offers a variety of services that can help your home look it’s best for potential buyers. Services include, carpet cleaning, floor cleaning for wood, stone and tile, mold and mildew removal, as well as a comprehensive cleaning service designed specifically for home sellers. Green cleaning methods and DIY concoctions are all over Pinterest, and every blog has another solution to tackle your chore list. But not all ingredients are good for your home and health…even if they are natural. When you get frustrated with your cleaning routine please curb the urge to experiment with mixing up different solutions. Some highly hazardous reactions can occur if you’re not careful. 1. Baking Soda + Vinegar: Skip any DIY cleaner that tells you to add these two together…it’s a waste of ingredients. Baking soda is a base and vinegar is acidic, so when combined the solution turns into mostly water. In addition, baking soda causes vinegar to foam up and can explode when stored in a closed container. 2. 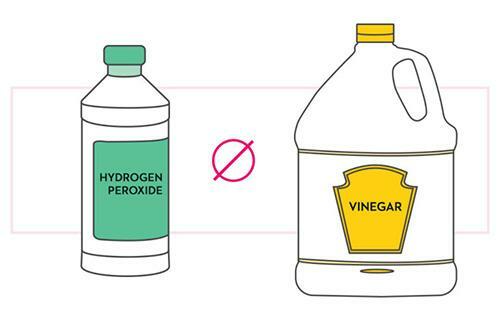 Hydrogen Peroxide + Vinegar: Combining these two can create acid which is potential toxic and can be irritating to the eyes, skin and respiratory system. 3. Bleach + Vinegar: When combined these two produce chlorine gas, which even at low levels can cause burning eyes, coughing, breathing problems and watery eyes. 4. Bleach + Ammonia: These two chemicals produce a toxic gas called chloramine which cause chest pain and shortness of breath. 5. Bleach + Rubbing Alcohol: You’ve probably heard of chloroform, but never actually been around it. Mixing these two create chloroform which can be irritating and cause breathing problems. We have all heard the words “green cleaning” and “eco-friendly,” but what do they really mean? Although sometimes used interchangeably, by definition they are different. 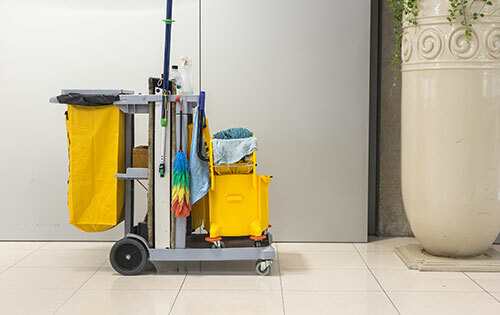 Green cleaning refers to using cleaning methods and products with environmentally friendly ingredients and procedures which are designed to preserve human health and environmental quality. While eco-friendly literally means earth-friendly or not harmful to the environment. At Bishop we focus on using eco-friendly methods while still providing exceptional cleaning with the latest technology. Just take a look at the ways our eco-friendly initiative will improve your home or office and leave you feeling good about your environmental impact. Less Chemicals: At Bishop, we’ve consolidated our chemicals to use fewer products on multiple surfaces. Only four chemicals are used for 95% of the cleaning in our Janitorial Division, which helps us reduce waste. These chemicals work together perfectly to give you the maximum clean without the additional harm to air quality or contribution to pollution. Less Water: We use soft water, as opposed to hard water, to clean your floors and upholstery. By using soft water, we cut down on the amount of water used to rinse out the cleaning solution which saves you money and cuts down on water waste. 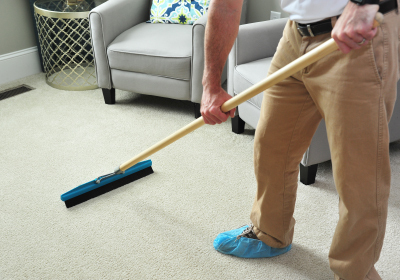 Less Trash: By maintaining your carpets and rugs with regular cleanings, your home and office will stay looking new longer. Fewer rugs and disposed carpet end up in landfills due to wear, tear and stubborn stains. 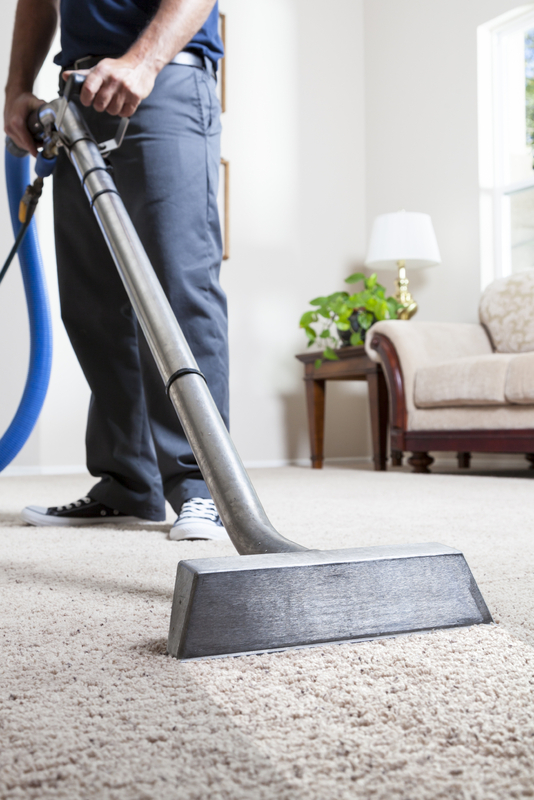 Carpet Cleaning Eliminates Trapped Pollutants. 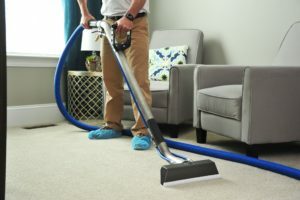 A dirty carpet can hold all sorts of indoor pollutants, and these pollutants, like pet hair, cockroach allergens, lead, and dirt, can emit toxic gases through daily activities such as vacuuming and walking. Professional carpet cleaning can kill these bacteria with special shampooing formulas and high-powered vacuums. Carpet Cleaning Can Clear Out Dust Mite Infestations. Did you know that many people have dust mite infestations, but don’t know it? Dust mites are microscopic, and although they themselves are not allergens the feces and body fragments they leave behind are. To get rid of these little creatures you need the professional service known as steam cleaning which emits a high temperature the dust mites cannot survive. Carpet Cleaning Can Help Prevent Mold Growth. In high humidity areas and when it rains a lot, your family can track water and dirt into your house. Having your carpet cleaned regularly can prevent mold and mildew growth, because professional carpet cleaners have high-powered drying tools that annihilate moisture. By eliminating moisture, you can prevent mold growth that can be harmful to your health if ignored for too long. If you’re inviting friends and family into your home this season, chances are your carpet will be left with some memories of their visit. Don’t panic! If you treat the stain appropriately (and please, don’t look on the internet! ), chances are we can help erase the bad memory of red wine on your beige carpet. A spot is easy to clean; a stain may not be. That’s because a spot is generally just a substance that is stuck to the surface of the carpet, such as chocolate or other food. Sometimes spots leave behind stains. A stain is a discoloration of the carpet fiber caused by color being added to the fiber. When color is added, it can generally be removed safely, but only by a trained professional. You only need one ingredient for treating spills in your home: water. For spots, apply a little bit of water to soften up the substance, and gently scrape away with a spoon. Remove as much excess as possible without over-wetting. Too much water can create a stain. 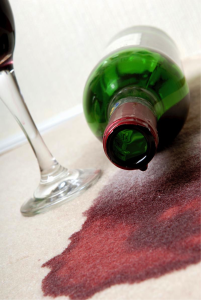 Spills caused by wine or other liquids almost always affect the entire carpet construction, including fibers and backing, and can create stains. If you have a stain, add an amount of water equal to the amount of product spilled to dilute the color. Immediately blot up the excess with a large, dry towel, soaking up as much as possible. Next, add half the amount of water previously used, and immediately blot again. Finally, add another half measurement of water, blot it away and add a new dry towel to the area covered by a waterproof weight. Leave in place for 12 hours to soak up all the excess. If you still have a colored stain, call Bishop to schedule a service appointment. Most carpet is very stain resistant, especially if it’s less than 10 years old and has been cared for properly. We have a variety of stain removal products that are safe for your carpet and rugs. Don’t let stains dwell, as repeated foot traffic and exposure to light can set the color in, making it more difficult to remove. Call us anytime at 229.883.1202 for advice on spot and stain removal. I have pets. How can I keep my home clean and odor free? 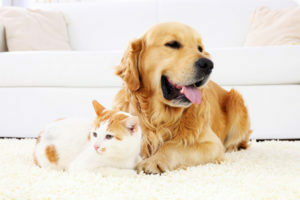 Minimize pet access to carpeted areas and upholstered furniture as much as possible. Respond quickly when you discover a pet “accident’. When you discover an “accident” area, blot the excess, soak the spot with a neutral cleaning agent, and blot (don’t rub) to remove the moisture. Call a certified cleaning professional. Avoid the grocery store remedies. Most merely mask the odor while the urine contamination problem worsens. Clean more frequently. According to public heath officials, homes with pets and children should have carpet and furnishings cleaned more frequently. Cleaning not only removes normal household soils, but it also removes pet hair and body oils that contribute to ongoing odor problems.